We waited years for Microsoft to launch its Surface tablets in India, and it's taken even longer for the Surface Book and Surface Laptop to arrive. This family of devices is meant to showcase Windows to the best possible extent - they're all unapologetically premium, but more than that, they're genuinely fresh and interesting. Microsoft is competing with its own partners by pushing out PC hardware, and is emphasising design and engineering to set itself apart. It's pretty obvious that Apple's success integrating hardware and software has influenced this strategy. Of all the Surface devices, the Surface Laptop is the most conventional. It isn't a 2-in-1, and it doesn't have a fancy engineered hinge or kickstand. It's meant to strike a balance between portability and productivity, and will appeal to those for whom the Surface Pro with its keyboard cover won't cut it. Interestingly, Microsoft had students in mind when it first launched this laptop over a year ago in the US. There's a lot to go through, so let's get started. 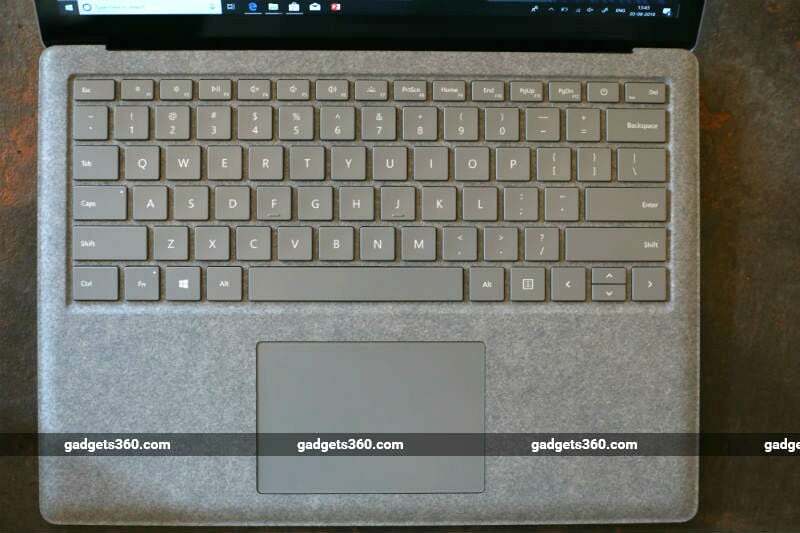 Everyone who sees photos of the Surface Laptop will want to know how its fabric deck feels, and honestly, it isn't easy to describe even though we've used it before on the Surface Pro's Type Cover. Alcantara is a material that's 68 percent polyester and 32 percent polyurethane, and it's a bit like suede with a slightly waxy coating. It isn't perfectly smooth, but it doesn't have the texture of cloth either. It didn't fray or come undone even when we scratched it hard, and it's moulded like plastic around the keyboard tray. The Alcantara extends all the way to the edges of the deck and is pinched down, leaving room for a fingernail to help you lift the lid when it's closed. The material is supposed to be resistant to spills and stains, and Microsoft even says it can be cleaned with warm water and mild soap, two things we wouldn't want anywhere near a laptop. We can't yet say how well it will hold up to long-term use, especially for people who tend to use their gadgets while eating. It's worth pointing out that the fabric has one major downside - it's permanently stuck on to the metal chassis. The only way to replace or repair anything on the inside of this laptop is to rip the layers apart with a knife, and there's no putting it back together after that. In fact, when the Surface Laptop first launched in the USA, it famously received a repairability index score of zero from iFixit. As for the rest of this laptop, it's fairly minimalist but still very noticeable. The lid has a simple matte aluminium finish, but with a prominent and highly reflective Windows logo in the centre. Microsoft has said that it isn't bringing the Burgundy, Cobalt Blue, or Graphite Gold options to India, which is a pity. The lid is pretty thin and it does bend and flex under pressure, but surprisingly there's no distortion whatsoever on the screen. The hinge is sunken and completely hidden under the fabric layer. It feels firm, and at least on our brand new unit, the lid didn't fall even if it was left just barely open. Overall, despite its waif-like appearance, the Surface Laptop seems to be built very well. The lack of connectivity will be a huge concern for many buyers. The Surface Laptop is even more minimalist than the MacBook Air, with only a single USB 3.0 port, a 3.5mm audio socket, and a Mini-DisplayPort for video output. There isn't even an SD card slot. Many ultraportables are light on ports, but the Surface Laptop isn't even that thin or light. 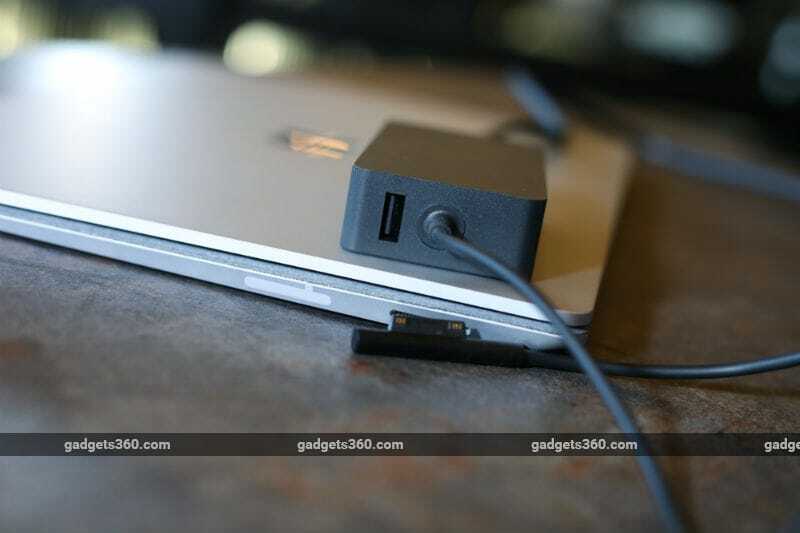 In this day and age we would have expected USB Type-C and preferred Thunderbolt 3, but most people will be fine with the far more common Type-A standard. Your only relief comes in the form of Microsoft's Surface Connect Port, the tab-like slot on the right used by the bundled charger, which also supports Microsoft's Surface Dock. This accessory will give you four more USB 3.0 ports, two more Mini-DisplayPorts, Gigabit Ethernet and another audio output, but it's listed for Rs. 17,560 online in India, which is an absurd amount to pay. The ports are also a little hard to reach thanks to the Surface Laptop's inward-slanting sides. Slotting the charger into the narrow Surface Connect Port in particular is an extremely fiddly process, and we wound up having to lift the laptop and bend over to see exactly what we were doing each time. The keyboard has one major quirk, which is the placement of the power button. Microsoft obviously wanted the Delete key to be in the corner above the Backspace key, but we found ourselves still likely to hit the power button by accident. It also isn't flatter or stiffer than the keys surrounding it, which would have been the obvious precaution to take. The Fn row has been displaced by the paging keys and various shortcuts, but you can swap the keys' primary and secondary roles by simply tapping the Fn modifier once, which is quite convenient. The Surface Laptop is only 14.47mm thick at its thickest point, and weighs only 1.25kg. It's super portable and super convenient to whip out of a sling bag or backpack. The only thing you get in the box with the Surface Laptop is its proprietary 44W charger, and we love its integrated USB port. You might not have enough ports on the laptop itself, but you can at least charge your phone on the go. However, we found the power cable to be a bit too short. Microsoft is selling the Surface Laptop in five different configurations, ranging in price from Rs. 86,999 to Rs. 2,33,999. At the bottom of the stack you get an Intel Core i5-7200U CPU with integrated Intel HD Graphics 620, 8GB of RAM, and a 128GB SSD. The top-end variant has a Core i7-7660U processor with Intel Iris Plus Graphics 640, 16GB of RAM, and a 1TB SSD. 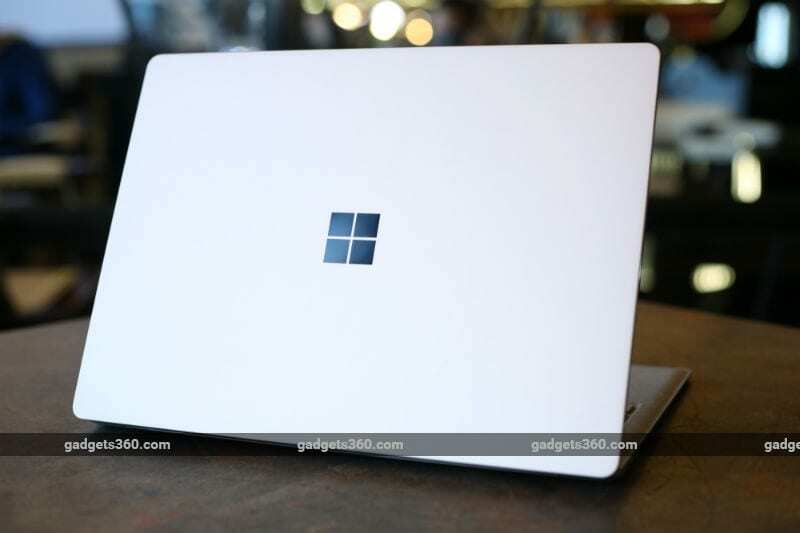 This is a pretty wide range, and so the Surface Laptop competes with premium thin-and-light models including the MacBook Air as well as luxury laptops and 2-in-1s such as the Lenovo Yoga 920 and Dell XPS 13 9370. It's worth noting that these 7th Gen Intel Core processors are nearly two years old and significantly weaker than current offerings. It's also surprising that Microsoft has launched such expensive variants here but not the entry-level ones with Core m3 processors and 4GB of RAM. We're reviewing the variant priced at Rs. 1,14,999, which has the Core i5, 8GB of RAM, and 256GB of storage. Considering that the RAM and SSD are soldered to the motherboard and there's no access to them anyway, you're going to want to account for future needs right from the start. Upgrades are simply not possible. The touchscreen measures 13.5 inches diagonally but has a unique old-school 3:2 aspect ratio. Microsoft chose this squarish shape for its Surface tablets, and it makes sense when trying to use a device in portrait or landscape. While the look is consistent here, it isn't necessarily useful. You might think of it as extra vertical space or reduced width. It isn't the best choice if you watch a lot of videos or need to work on two documents side by side, but it works well for general productivity. The resolution is completely non-standard at 2256x1504, and makes for a density of 201ppi. Windows 10 scales to 150 percent by default and we found this to be comfortable and crisp. This might not be a 2-in-1, but the touchscreen can still come in handy. We didn't wind up using touch a lot, but it's always nice to have. The Surface Pen is supported, but won't be particularly comfortable to use. One thing that we don't often see even on premium laptops is an ambient light sensor, which means that brightness adjusts itself automatically. Above the screen is also a 720p webcam and the sensors needed to support Windows Hello face recognition. Stereo speakers are embedded beneath the keyboard. Microsoft isn't publishing an exact battery capacity, but iFixit has discovered that it's a 45.2Whr unit. It's rated for 14.5 hours of video playback which is impressive on paper, but we'll see shortly how well it really performs. Our review unit was running Windows 10 Pro. The Surface Laptop was initially meant to ship running Windows 10 S, a reduced-functionality version of Windows. Somewhat like Windows RT, Windows 10 S made Edge and Bing the default Web browser and search engine respectively, without any ability to change them. Users could also only install apps from the Windows Store rather than just downloading anything they like. This was meant to usher users into an iOS-like walled garden, but due to massive backlash, this edition of Windows has been discontinued. Instead, the Surface Laptop ships with Windows 10 in "S Mode", which behaves the same. This mode can be disabled at no cost - as long as you find an option that's buried within the Microsoft Store app. With no clear direction, this might confuse a lot of buyers who just want to download Google Chrome or any other common software. We got used to the 3:2 screen without even realising it. It's great for reading Web pages and working on Word documents. There are of course thick black bands when watching most video content, and this can be quite distracting because of how reflective the glass is. The biggest problem we faced was with games - some titles simply aren't designed to scale to non-standard aspect ratios. Graphics tests and games did not do as well, thanks to the basic integrated graphics capabilities of the Intel CPU. Unigine Valley gave us just 16.6fps on average, at 1920x1080 and using the Medium preset - but it ran stretched to fill up the whole screen. We tried the touch-friendly Age of Empires: Castle Siege from the Microsoft Store, and it ran perfectly well. We ran Rise of the Tomb Raider's built-in benchmark at 1920x1080 and it stretched itself to fill the screen. We got just 8.16fps at 1920x1080 using the Low preset, and scaling down all the way to 1024x768 gave us just 15.78fps, which was not only unplayable but looked awful. Doom has an aspect ratio control, but the only resolution available at 3:2 was the native 2256x1504 which is way too high for this GPU to handle. The game did run letterboxed 1280x720, but we only got 15-25fps in real-world gameplay, meaning that modern 3D games are completely out of the question. Finally, we come to battery life. The Surface Laptop's 14.5-hour claim seems to be accurate. We started our day with a full battery. With casual Web surfing and typing plus a bit of video streaming with the screen brightness adjusted automatically, we were only down to about 85 percent in two hours, and we were able to get through a full 8-hour workday before running out of power. The Battery Eater Pro stress test ran for 2 hours, 27 minutes with the screen brightness set manually at 50 percent, which isn't bad at all for a thin and light laptop. The most polarising thing about the Surface Laptop is its Alcantara fabric surface. Throughout our review period, we kept evaluating how we felt about the texture and finish, and we have to say that we weren't exactly bowled over. If you type for a long time, you might not like the texture against your wrists. We wouldn't miss it at all if it was gone, and we definitely wouldn't pay extra for it. The most affordable variant with Intel Iris Plus graphics comes in at Rs. 1,44,999 which puts it right up against the much more appealing Lenovo Yoga 920. It's also very hard to imagine paying Rs. 2,33,999 just to get 1TB of storage space - for that kind of money you could buy the much more impressive Microsoft Surface Book 2. With that said, there's a lot to like about the overall package, if you can afford the price. 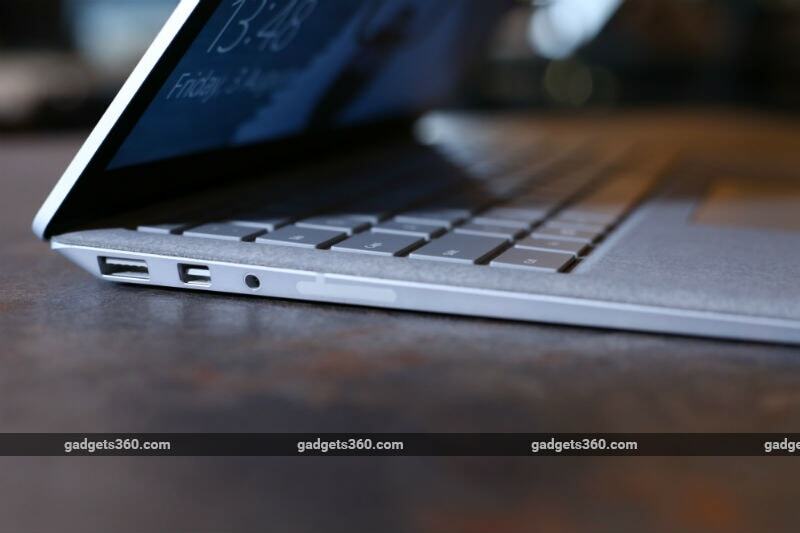 product The Microsoft Surface Laptop is pretty expensive, but there's plenty to like. Read our review for details.